By using a closer than shoulder-width grip, you put more stress on your triceps than the wide grip variation and thus force it to do more work. It is a compound mass building workout that puts less strain on your elbows, allowing you to lift more weights than you could with an isolation exercise. 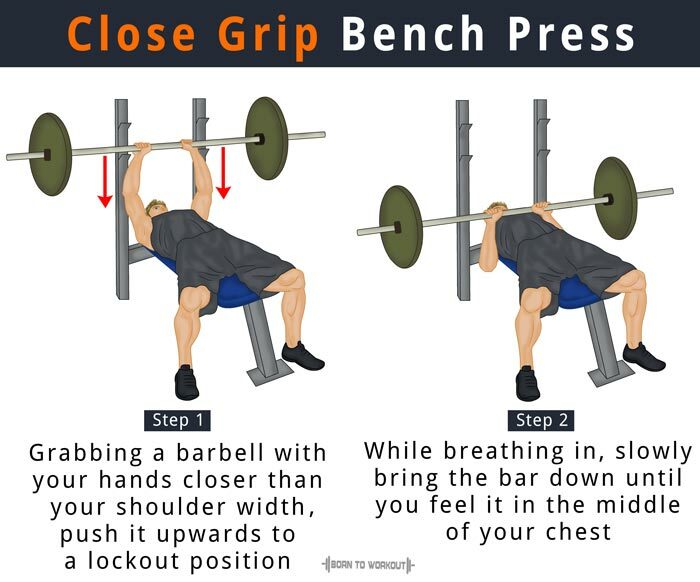 Assuming a seated position on a bench, grab a barbell and lift it from the rack with your hands placed closer than your shoulder width. Push it upwards until your arms are locked out. It is your initial position. Slowly bring the bar down until you feel it in the middle of your chest. After pausing for a second, use your triceps muscle to push the bar back to your starting position. Lock your arms at the top and hold the position for a second before coming down again. Repeat the steps for the recommended amount of repetitions. Place the weight back on the rack. 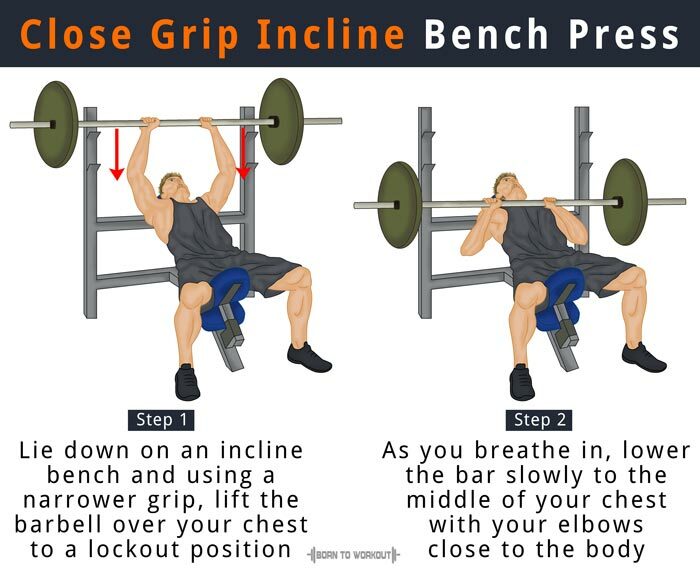 Lying back on an incline bench, grab the barbell from the rack with a slightly narrower grip than your shoulder width and lift it over your chest until the arms are locked out. It is your initial position. Lower the bar slowly to the middle of your chest while breathing in. Make sure to keep your elbows close to the body throughout the exercise for maximum triceps involvement. Push the barbell back to your initial position while you breathe out. 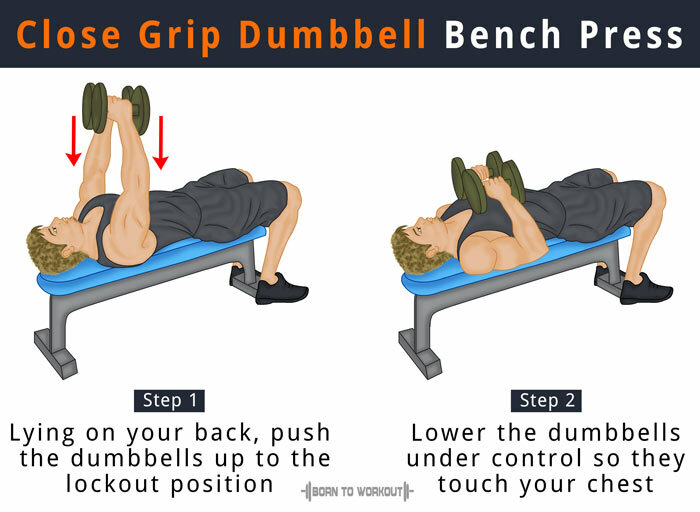 Hold a pair of dumbbells with your palms facing in (neutral grip) and sit on a bench, positioning the ends of the weights on your hips. After lying on your back, push the weights up and hold them at your chest level. Raise the dumbbells to the lockout position at the top. It is your initial position. Continue lowering the dumbbells under control until they touch your chest. Press them up again to the initial position. Repeat the above steps for the recommended number of reps.
Use a spotter to assist you in lifting the bar off the rack. If no one is available, start with the lighter weights. Do not allow the weight drift excessively forward. Do not let the weight bounce off your chest or touch the chest with excess momentum.